You know, we have zoning development standards for a reason - to make our City a well functioning, attractive, and structurally safe place to live and work. Unfortunately for our City, the Boards of Zoning Appeals give out variances at head spinning percentages. A study of variance petitions passing through the BZAs during 2009 demonstrated that of 245 variance petitions filed, 223 were approved - for a numbing 91% approval rate. If you have the money for the filing fee, you are pretty much assured of getting your variance. But, the community loses in this race to the bottom. If a law needs to be changed, then change it so that everyone is abiding by the same laws. This onslaught of poor decisions on variances year after year causes an erosion in our zoning laws, creates havoc in enforcing them, and throws out all efforts a reasoned planning for a great City. As regular readers of my blog know, I have been looking into just how many required parking spaces have been waived by the decisions of the Boards of Zoning Appeals (see "BZA Decisions Contributed Mightily To Broad Ripple Parking Situation", and, "Broad Ripple Parking - More BZA Decisions Noted - Running Total 320") Today I will report the latest tally of parking space variances granted for Broad Ripple going back to 1979. Before I wade into the methods and results, I want to specifically thank Heather Stephan of Current Planning, who pulled several dozen documents for me in record time. I also need to acknowledge that the entire linkage between BZA decisions and any perception of parking insufficiency in Broad Ripple came from BR resident and community activist, Clarke Kahlo. I searched the City's Accela website for variances filed for any property within the area bounded by 62nd to the south, 64th to the north, N. College to the west, and N. Winthrop to the east. As I noted in a previous blog, I could turn up no results of any kind for Broad Ripple Ave, likely due to its two-word name. As luck would have it, there is a current variance being requested at 829 Broad Ripple. Melanie Mullens, Senior Planner for Current Planning, had gathered a list of previous variances filed in the area, as part of her usual due diligence. I obtained further variances from her list. Using this master list, I requested a copy of the letter of 'Grant of Variance' for all those I had indication were actually approved. From this letter I hoped to gather the number of parking spaces approved and the number required by ordinance. The number waived would be determined by simply subtracting the number approved by the variance from the number required under the ordinance. 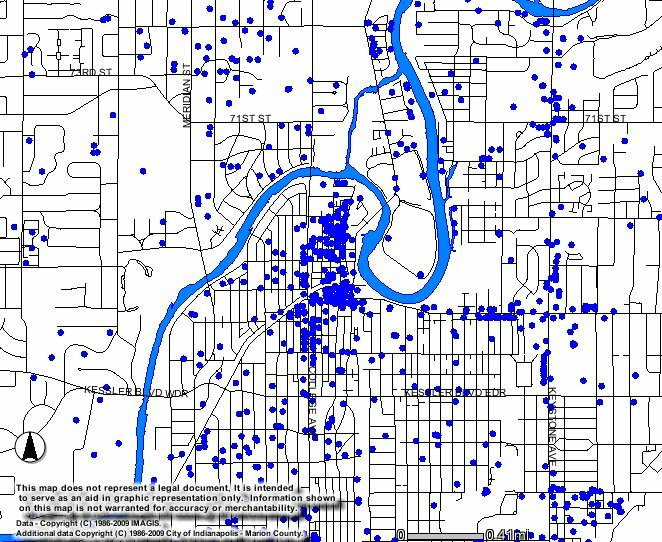 I found 41 variances filed asking for a waiver of the required number of parking places since 1979. One was withdrawn, two were dismissed (which usually happens due to prolonged lack of interest of the petitioner), and 38 were approved. None were denied. The letter of Grant of Variance did not include the number of spaces required for 9 variances granted between 1979 and 1994, but did indicate a waiver of some number was approved. So, the number of waived parking spaces I could obtain is merely a minimum. That left 29 variances granted for 22 addresses since 1987. I assumed that when there were two variances for the same address, the latest one reflected the totals for that address. 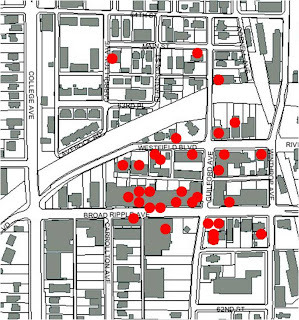 The 22 variances granted a waiver of a grand total of (drumroll, please) 646 parking spaces in this area of Broad Ripple. 646 parking spaces waived in a couple block area of a busy night spot. These variances brought the number of parking spaces required by ordinance, which totaled 912 for these addresses, and waived 71% of them. Instead of 912 spaces, the variances said it was okay to provide only 266. I can hear them now : "Don't need no stinkin' parking in Broad Ripple !!! Of course you can have your waiver, good sir !!!" Clearly, the decisions of the BZAs have led to whatever need there might be for parking in Broad Ripple. The residents have suffered the consequences every weekend late night for some time. Now, the taxpayers are suffering the consequences. More News About Broad Ripple Parking Garage Deal - Sheesh ! If the garage is profitable - the City can buy it for $1. If the garage is unprofitable - the developer can make the City buy it for $1. Fellow blogger and lawyer, Paul Ogden, does an excellent job of analysing the legal illogic embodied in this strategy in his entry yesterday "Council President Ryan Vaughn Claims Broad Ripple Parking Garage Will Have Two-Way, Buy-Sell Option; Vaughn's Claim Strains Any Credibility". I highly recommend you read it. I have to look at it this way - if the garage is profitable, why would the City essentially take it from the developer? Don't we want private enterprise? I know that's why I question a lot of deals that the City makes, because the taxpayers are bankrolling what should be private enterprise on the private dime. I can't imagine any Mayor taking the heat for taking a profitable business from any business person for $1 for any reason - contract or no contract. If the garage is unprofitable, why should the City's taxpayers be on the hook for it? Why is the theme of the Ballard administration that business should not carry any risk? In one deal after another, Ballard forks over large sums of taxpayer cash to a developer and crafts a deal to remove any future risk to the develop, and transfers that risk back to the taxpayers. Remember No-So; the poster child of no risk to the developer? Last night, the Elected Councillors serving on the Metropolitan Development committee of the City-County Council, in effect, told the public that their opinions on who the Council appoints to important boards and commissions, is none of the public's business. The particular focal point of the public gag order was the committee's discussion of the appointment of one Richard Kraft to a vacancy on the Board of Zoning Appeals 3. The particular fall guy for the gag order was one Clarke Kahlo, who seeks to improve our community, in part, by improving the decisions of boards like the BZA. Fellow bloggers Gary Welsh (Advance Indiana - "GOP Council Committee Refuses To Hear Public Comment") and Paul Ogden (Ogden On Politics - "Republican Councillors Refuse To Allow Public Testimony On Controversial Appointment To Zoning Board") covered this earlier. I think Gary and Paul did a great job. I would just have to say, that Democrat Councillors were present in the room and did not protest the gag ruling. I know nothing of Mr. Kraft, and this blog entry is solely about public policy. The Councillors knew two years ago, that the appointment hearings of some individuals could embarrass the appointee and those Councillors who picked them. Democrat and Republican alike had two years to find a way for public input into these important matters. At best they fumbled the ball that only they get to carry. At worst they put on their best Boss Hog attitudes and told the public to take a hike, that the public's opinion meant nothing to them. The work of the BZAs and the Metropolitan Development Commission causes good and evil to fall upon our community. These very important panels are commonly populated by political-party-approved folks, and do not fairly represent the broad community. At every turn the Councillors complain about how hard it is to get folks to serve. Yet, every year the Council fails to even experiment with having just one of the three BZAs work evening hours. This would immediately provide a whole host of individuals who would be willing to serve, but could not contemplate getting one afternoon a month off from work. An additional bonus falling out of an evening BZA meeting is that more neighbors could come and speak their mind about petitions that will affect them. But, working stiffs who have no flexibility cannot be a Board member under current conditions, nor are they able to often speak at hearings on zoning and variance matters that affect their quality of life and property values. And, make no mistake, that's exactly the way some people in high places want it. It is paramount that the Council find a way to let the public speak on the wisdom or insanity of the Council's picks to all of the boards and commissions. You simply cannot pretend to value public input, then tell members of the public to shut up, move along, their opinions do not matter. That applies to the Republicans who hold the majority on the Committee and the Council, and it applies to the Democrats who hold their tongues. Janice McHenry (Chair), Paul Bateman, Jeff Cardwell, Jenny Cain, Brian Mahern, Dane Mahern, Jack Sandlin, and Angel Rivera. In response to Jeff's request on the last blog post, here are some documents that I've uploaded onto Google Docs. TIF Districts - Who Knew The Base Could Drop? I'm sure some folks in Marion County know that the base of a TIF District can drop. But, not once was that ever indicated while I was present in a discussion of TIF Districts. A Tax Increment Financing District is an area created to help finance and spur development. The additional, new, taxes collected after the District is created, go to pay off bonds that were floated to support the new development in some way. Sometimes the assistance is in the form of infrastructure improvements, like new street, sewers, etc. Sometimes it is in the form of helping with construction costs. I always heard that the property taxes collected from the property prior to the creation of the District would always go to the usual taxing units as it always did before. The idea is that there is a 'base' assessed value and the property taxes from the base would flow to the schools and townships and library and IndyGo, etc. Only the taxes from the increased accessed value (or "increment") would be used to pay off the bonds floated for the TIF District. Well... turns out not to be the full story. I obtained copies of a form called "County Auditor's Certificate of Adjustment to the Based Assessed Valuation of TIF Districts" for 40 TIF Districts in Marion County, covering this year's property tax collections. These forms are submitted to the Department of Local Government Finance by the County Auditor; Billie Breaux in this case. Overall, the 40 TIF Districts had a combined gross AV of $4.81 billion. The base AVs had a combined value of $1.45 billion. In the period between 2010 and 2011, assessed values all over the County dropped. If one accounted for that drop, the base should have come in at $1.5 billion. But, instead, the combined base AV dropped an additional $43.4 million. That means over the county, individual property taxpayers had to pay a bit more to cover the shift in base AV. All TIF Districts did not change in like manner. While none had an increase in base value, after accounting for the general drop in AV due to the economy, 10 stayed the same, 15 were at zero and stayed at zero, and 15 accounted for the $43.4 million drop in base AV (again, after accounting for the effect of the economy on real estate values). Now, this might be beneficial in the bigger picture, if there were no real growth in AV - since the bills still have to be paid. But, the AV grew substantially. All 40 TIF Districts combined for real growth of $203,337,569. Surely the base could have been maintained with that kind of real, additional growth. The 10 districts whose base stayed the same (after adjusting for lower real estate values), combined for $133.6 million real growth. The 15 districts whose base was zero in 2010 and remained zero for 2011, the combined growth was $15.4 million . And the 15 districts that lost base value combined for a real growth of $45.2 million. Add that to the loss of base AV, and you have a taxable increase in the "increment" of $88.7 million. So, what do we have? The base AV has always been promised as a continuing source of property tax dollars. We are always told that we can count on that and the new development will pay for itself and ultimately contribute to us all once the TIF district is retired. Only they don't retire TIF districts, do they? Sometimes they DO return all of the tax dollars to the regular taxing units. For 2012, only 3 TIF Districts will return all the tax dollars to these regular taxing units, down from 5 Districts doing so in 2011. But, we were lulled into thinking that at least we had the taxes from the base to keep us going. But, nooooo..... Excluding areas owned by government, the initial base AV of a TIF District cannot be zero. The fact that by 2010, 15 had sunk to zero AV, suggests the erosion of the base AV over time. Now, two of those 15 are or were owned by the government, so zero AV is understandable in those two cases. Of the remaining 13, though, fewer and fewer property tax dollars flowed to the regular taxing units from TIF District areas, and that means the rest of us picked up the slack in our tax bills. The way this particular DLGF form recalculating the base AV works, there can never be an increase in the base AV (outside of an increase in real estate values generally). Once the base AV reaches zero, there can be no increase, even with an increase in real estate values generally. I do have to wonder what the initial base AVs were for all of our TIF Districts and what the full extent of the erosion in that base AV has been. This raises a lot of questions about what can or should be done to fulfill the promise that if we create a TIF District, well at least we can count on the base AV to support our schools and libraries and public transportation and township/fire safety. Meanwhile, there is enough to do, just to digest the meaning of base AV in a TIF District. The City-County Council Rules and Public Policy Committee meeting, regularly scheduled for this Tuesday, July 26, has been rescheduled to Tuesday, August 10, at 5:30 pm in Room 260 of the City-County Building. This also means that the Committee's review of the Superbowl Ordinance (Prop 188) is also rescheduled to that date. Rarely do I read an article in the IBJ about TIF Districts and say to myself, "Excellent" ! Well, that's not entirely true. I never have. Until today. IBJ reporter, Francesca Jarosz, reports in today's edition, that City officials are looking at creating rules to return excess TIF funds back to the base taxing units, like the Library and schools. If you don't have a subscription to the IBJ, you might be able to track them down at your local Library branch. IBJ has become a must read for me. The city is considering ways to channel money captured for economic development in some of its 22 tax-increment-financing districts to units such as libraries and city-county government. City financial officials and consultants are evaluating whether they can afford to shift some of the property taxes within the TIF districts back to the general tax base. They must make a determination by the end of this month. City-County Council leaders also plan in the next month to start a public discussion on how to craft guidelines for using TIF in ways that maximize revenue for basic city services. But, what can I say, except, Excellent ! Bring on that community conversation ! I am still compiling the list of Variances granted by the Boards of Zoning Appeals for reduced parking in the Broad Ripple area. As shown already in my recent blog post "BZA Decisions Contributed Mightily To Broad Ripple Parking Situation", these grants of Variance account for more than the supposed shortage on Friday and Saturday nights after 11 pm. Well, you can add another 4 Variances that contributed another 94 spaces to the shortage. This brings the running total up to 320. We are getting close to the capacity of the proposed parking garage, for which the taxpayers would contribute $6.35 million. There are another 23 Variances that mention reduced parking in their summary, but complete information as to how many that amounts to is lacking. I will be getting more information about these and others.﻿ Stay tuned. Indiana Constitutional Debt Limit - How Do Taxing Units Fair? I am not going to pretend to understand the mechanisms whereby taxing units get around the debt limit set by the Indiana State Constitution. All I know is that when they want to, there appears to be a way. I have put together the information as best I could tease it from the information sent to me by the Indiana Department of Local Government Finance and the individual taxing units. I obviously previously missed a couple more taxing units, including the City of Lawrence. I will continue to contact these units for their debt information and include it in the table below as well as in my previous post as I get it. I continue to put City and County and Health & Hospitals and CIB together, as H&H claims debt obviously owed by the CIB and the County claims debt obviously owed by H&H. The debt limit is calculated by the DLGF as follows: The total Assessed Value of the property that may be taxed by a unit is divided by 3 and that result is multiplied by 0.02 (2%). With all that said, the taxing units that have less debt than allowed under the Indiana Constitution are noted with an asterisk (**). Those whose debt numbers I still do not have are noted with a question mark (?). The decisions of the Boards of Zoning Appeals have contributed significantly to any shortage of parking spaces in Broad Ripple. 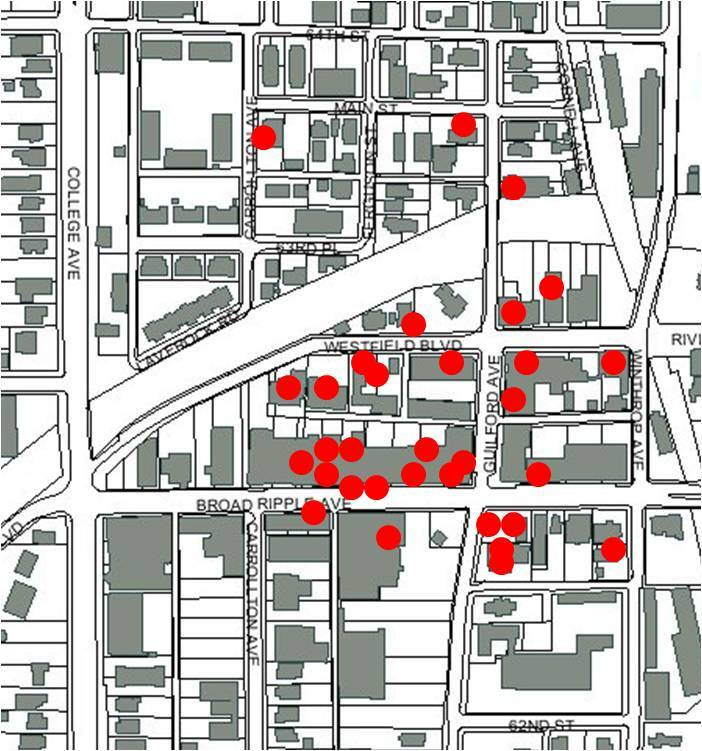 A cursory look at variances granted by the BZA for Broad Ripple addresses demonstrates at least 226 spaces written off. A 2007 study concluded that a particular 6 block area of Broad Ripple had a deficit of 132 parking spaces at 11 pm on weekends (adequate at all other times) and projected to have a deficit of 180 parking spaces at 11 pm on weekends in the future. The idea for linkage between BZA decisions to reduce the required number of parking spaces and any perception of need for Broad Ripple parking spots came from Broad Ripple resident and neighborhood activist, Clarke Kahlo. My first stop was to the City's GIS mapping function. Below is a display of variances granted in the Broad Ripple area. These variances are for any number of requests, not just to reduce the number of required parking spaces. To begin an examination of the BZA/BR parking correlation, I plugged a set of street addresses into the City's "Citizen's Portal". I searched for variances for 515-927 Westfield, 700-1000 Broad Ripple, and 6200-6400 for N. College, Guilford, Carrollton, and Winthrop Avenues. I could get no information about Broad Ripple Avenue variances; the two word name is likely the problem as the City's GIS map shows multiple variances on that street segment. The reports generated included brief descriptions of the variances requested. While many of the descriptions included a reference to reduced parking, I report below only those that gave both the number requested/approved and the number required by ordinance. It will take more time to follow up on all of the variances reported for these streets and to get the information for Broad Ripple Avenue. But, clearly, the data are sufficient to conclude that had the BZA's be more strict and denied variances for parking spaces in this area, there would be no perceived need for a new parking garage and no need for a $6.35 million taxpayer subsidy. Superbowl 2012 - What Are They Trying To Hide? The Superbowl Ordinance, Proposal 188, 2011, now before the City-County Council's Rules and Public Policy Committee, leaves a lot of blanks. These blanks are in the form of specific regulations and unilateral decisions to be made by folks in the Department of Code Enforcement. To better understand the full implication of Prop 188, I requested a list of those regulations being considered by DCE under this proposal. They responded that they "cannot develop or propose regulation unless there is an ordinance in place". Come on. The City of Indianapolis, and DCE specifically, are undoubtedly aware of exactly what features the NFL wants in place in this ordinance. Like the Clean Zone, for instance. So... I requested a copy of all correspondence between DCE and any representative of the 2012 Superbowl Committee. And, I asked City Legal for a copy of any agreement between the City and the NFL regarding Superbowl 2012. The former is still in process, but just last night I received a reply to the latter request. The City of Indianapolis has undertaken a search of its public records and did not locate any records responsive to your request. There IS NO agreement between the City of Indianapolis and the NFL regarding Superbowl 2012 ! Who will pay for police presence during the 2 week event? Will the City provide, through its code enforcement and police force, the manpower to patrol and cite any vendors selling competing merchandise? Will the City provide, through its code enforcement and police force, the manpower to patrol and cite any vendors using trademarked terms owned by the NFL - like the word 'superbowl'? Will the City allow types of signage that are illegal inside Marion County without a variance? Will the City allow the creation of 'clean zones' wherein the NFL will have final say as to who gets a vendor's license and for what purpose? Will the City close specific streets to vehicular traffic to widen the NFL village to suit the purposes of the NFL? The list goes on. There is a detailed agreement, for sure. The NFL wasn't born yesterday. Likely the City has used the 2012 Superbowl Committee to run legal interference so that John and Jane Q. Public only gets the information that Mayor Ballard and the NFL wants them to have. So... I changed my request. As of last night, I have requested a copy of any agreement between the City of Indianapolis and any organization regarding the 2012 Superbowl. When the City makes getting clear information in a timely manner difficult, you are forced to wonder - What are they trying to hide? The total debt (minus Southport, Center Township and Lawrence) at the end of 2010 was $6,777,164,786. That amounts to $7500 per man, woman, and child in our County. Below is a breakdown of the data by taxing unit. I combined the City and County with debt for the Capital Improvement Board (CIB) and Health & Hospitals as there were bonds that were attributed to each whose purpose was for another and it would leave a wrong impression to separate them out. For instance, there were bonds whose purpose was listed as Wishard, but some being the responsibility of the County and other of H&H. Also, water company bonds are included in that combined category (I found bonds totalling about $818 million that referenced 'water utility' or 'water system'; I'm not sure which bonds and debt will be taken over by Citizens Energy as part of the sale of the water and sewer utilities). Today I want to add two other features of HB 1007 that have made it into law - one sort of a good idea, and the other not. The better idea is now contained in IC 6-1.1-12.1-16. A property qualifies for a 3 year, 100% abatement, under one of two conditions. First, if the parcel is located in a designated downtown district, has a vacant building on it that exceeds 50,000 square feet, and the owner is looking to invest at least $10 million into the upgrades. Second, if a county has experienced for 2 years, an unemployment rate that exceeds state average by 2% for both years, they may apply this abatement anywhere in their county. Now this law isn't all that bad. Its intention is clear and measurable, and the abatement is of short duration. Not withstanding that, it is totally superfluous, given the next section of the Code that allows 10 year, 100% abatements for any property in any county in Indiana. Now, for more fun, HB 1007 also spawn a new COIT-sharing law. IC 6-3.5-9 requires approval of any deal by the fiscal body of the city or county. Here in Marion County, that would be our City-County Council. A City or County can enter into an agreement to hand over County Option Income Tax and Local Option Income Tax, created by the hiring of new employees who reside in that city or county. The COIT and LOIT money may be provided to the employer for up to 10 years. It can be any fraction of the COIT/LOIT increase up to 100%, or a fixed dollar amount. There are a couple of blah-blah-blah requirements, such as "the hiring incentive is a major factor in the applicant's decision to go forward", where they just wave their hands and it is so. There is one limitation, the new employment may not be due to jobs being relocated within Indiana. So, for those who curse paying taxes... here's what is going to happen. Just like already happened with regular abatements with standard rules applied by the State, there will be an all out bidding war between cities and counties. Places like Lawrence and Hendricks County will likely lead the race to see who can give out the biggest and best tax incentives, until it is not competitive for any other city or county in Indiana to refuse to give the store away, too. Ten years folks. Ten years - where all of the increased property taxes and all of the increased COIT/LOIT revenues will be turned over to the business on that property. This is irresponsible. Any city or county that utilizes these new laws (and all will), does not have any right to cry and moan about constricting tax revenues and tight budgets. If they make any cutbacks, they should be required by the public to explain how they then could afford this kind of corporate welfare. The Indiana Legislature did a lot of damage this past session. A lot of damage. Parking is a problem in Broad Ripple and the City's investment in and finding a developer for a garage there is appropriate. But, the financials of the deal should be revealed by the City. This follows last week's IBJ article by Cory Schouten, who, like I, was denied access to the construction costs and operating expense analysis submitted with the winning bid by the Keystone Group. Good. We all need to continually push for the public's right to know. Sometimes things are hidden by officials because revealing them would bring embarrassment or worse to an office holder. Other times things are hidden simply for convenience. Sadly for our democracy, when officials withhold information, they forget that they are elected to serve the public. For the public to ask for proof that they are doing that job well, is appropriate. The Metropolitan Development Commission is in the process of granting Pure Power, a Navistar company, a 7 year abatement amounting to about $897,712.76, or a 62.1% savings. The MDC will hold a public hearing on this abatement at their regularly scheduled meeting on July 20. The abatement resolution and statement of benefits estimates that Pure Power would retain 30 jobs, create 200 additional jobs by 2013, and invest $19 million in new equipment. I send my readers over to Advance Indiana for a detailed look at the abatement failure of Navistar and clawback implementation of $5m of that abatement in his entry "Ballard Administration Continues to Bleed Taxing Districts With Abatements". Scott Olson, reporter for the IBJ, published information about the abatement and Navistar's history in "Navistar seeks more tax breaks after old deal failed". "Over the seven years [of the abatement], the company would save $897,712 in property taxes and pay $574,879." Long story short, the last Legislative session enacted a new law that is so watered down that abatements look to be ripe for the plundering and could result in 10 year, 100% abatements. (1) The total amount of the taxpayer's investment in real and personal property. (2) The number of new full-time equivalent jobs created. (3) The average wage of the new employees compared to the state minimum wage. (4) The infrastructure requirements for the taxpayer's investment. (b) An alternative abatement schedule must specify the percentage amount of the deduction for each year of the deduction. An alternative abatement schedule may not exceed ten (10) years. The new law originated with HB1007. The original language laid out a specific manner in which the percentage of an abatement could be calculated, based on the size of the investment, number of new jobs created, average wage of new jobs, and infrastructure already in place. These rules were struck from the bill almost immediately. It is now up to each city or county to determine. Lest you think the rules in the original language were tough... Under those rules, Pure Power/Navistar would have qualified for a 10 year abatement, with 100% of property taxes forgiven for each of the first 7 years, 75% forgiven for year 8, 50% for year 9, and 25% for year 10. This bill did a number of other things as well. More on that later. This past legislative session was nothing to be proud of. Now the taxpayers can expect even bigger chucks of tax dollars given back to big business in the form of higher and higher abatements. You just knew it would happen. Last year the City released, upon request from many people, a list of TIF districts, how much revenue was anticipated coming in from property taxes, and how much the debt service requirements were. On that list were 5 TIFs listed under 'Dormant TIFs' with a footnote that the incremental property taxes were passed through to the base. That means that the property taxes obtained from the TIF district improvements were not needed to pay off bonds, so the money went to the various taxing units in the same proportions that regular property taxes would be distributed. On Wednesday, the Metropolitan Development Commission approved the re-engagement of two of these districts. One is the Dow Elanco TIF (aka the 86th Street and Zionsville Road Economic Development Area). I am being told by Deron Kintner (Executive Director of the Bond Bank) through John Bartholomew (Public Information Officer of the Department of Metropolitan Development), that the roughly $6 million of incremental property taxes that passed through to the base last year would continue to do so next year. Bonds have been floated so that the City could make infrastructure improvements to aid Dow Elanco and AIT Laboratories. The other is the Naval Air Warfare Center (NAWC) in Warren Township. In 1991 it was deemed part of the United TIF (aka Airport Economic Development Area), but at some point since then became untied from repayment of those bonds. Now, in order to make improvements to the NAWC, the TIF is being reengaged to pay for the bonds that will finance the improvements. This is to the benefit of Raytheon. On Tuesday the Indianapolis Airport published a public notice regarding its proposed 2012 budget. The have two funds with a total budget estimated at $269,648,000. The notice indicates that the airport will not raise property taxes for any of that budget. Please see my blog entry "Airport to Receive Property Taxes - Make No Mistake About It" for more information on the topic of how the airport plans to, in fact, receive property taxes by retaining property that should be sold, simply by calling it a 'lease payment'. I hope everyone enjoys this most American of all days. Let's hear what is on your mind. Time for a free-for-all. "City mum on economics of $15M Broad Ripple garage project"
Both city officials and the developer of a proposed 350-space parking garage in Broad Ripple have refused to share financial projections for its construction and operation, describing the documents -- as a "trade secret" exempt from public disclosure." The article covers more than the public assess issue. Schouten goes through the high points of each competing bid and offers quotes from many of the players. Schouten has a fantastic quote from Ersal Ozdemir, CEO of Keystone Construction, a partner in the winning project. All I can say about that is -- if the garage was doable as a private deal, and they would make more money doing it that way, why are the taxpayers involved at all? Of particular interest, to my eye, was the side bar that provides an IBJ analysis of the cost breakdown of the proposed garage project and how it might add up to $15 million. This analysis includes $4.5 million for acquisition of the property. The property will be leased, however, not purchased. The cost of the land, therefore, becomes an operating expense, and not a cost of construction. Schouten also touches on the 2007 study of parking needs in Broad Ripple, done by Walker Parking Consultants, another partner in the winning proposal. This study determined that the current site was inadequate and also estimated the cost of construction, without land purchase or building demolition, at about half the price of the current proposal. Schouten brings up Ozdemir's campaign contributions to Greg Ballard and his hiring of former Ballard Chief of Staff, Paul Okeson. Schouten goes into the fact the the winning bid actually proposed two versions of this project FOR LESS MONEY. Yes folks, thanks to the keen fiscal responsibility and business acumen of the Ballard Administration, the price tag went UP during negotiations between the City and the bidders with the winning proposal. Wow ! Adequate words escape me. Back to the public access issue. As I noted in a previous blog entry (see "Are Taxpayer Dollars Being Flagrantly Misused? "), I was denied the financial analysis of the winning proposal, with the City stating it was information to be protected as a 'trade secret'. I have filed a formal complaint with the State's Public Access Counselor. I will have to amend that complaint to add the fact, ferreted out by Schouten, that other bids, losing bids mind you, had the financial analysis included in the materials provided to the public by the City. So, how can they claim that only the winning bidder's numbers need protection. In addition, Schouten reports that the City will release the winning bidders' financial analysis, once the deal has closed. So, let me summarize the Administration's position on public access to the key portion of the winning proposal. Nope, you can't have it because it is a 'trade secret' and State law protects disclosure of 'trade secrets'. Yes, you can have the financial analysis from non-winning bids. No 'trade secrets' there. Once we have the deal finalized and the terms become contractual obligations of the City and the City's taxpayers, then the financial analysis of the winning bid will be provided to the public. At that point it will no longer be a 'trade secret'. Anyone know what kind of logic is being applied here? The Indianapolis-Marion County City-County Council is now considering changes to our ordinances to accommodate the wishes of the NFL concerning Superbowl 2012. These are contained in a rather lengthy Prop 188. An entirely new section of law is being included (Chapter 986 - begins on page 7 of the pdf) that should receive much public scrutiny. Prop 188 goes before the Rules committee this Tuesday, July 5, in room 260 of the City-County Building. The meeting begins at 5:30 pm, and Prop 157, which proposes restrictions on towing companies, is also on the agenda. Clean zone means a geographically defined area within a special event zone during a civic sponsored special event that no temporary advertising, signage, or structures shall be erected or transient merchant, vendor, or otherwise licensed activity may take place without the person or entity performing such activity first having received approval from the event sponsor and a limited duration license from the bureau of license and permit services. So, a bar that has the fortune to be near Lucas Oil Stadium may not post a 'Welcome Football Fans' banner without having the specific okay of the NFL - for instance. Also note that a special event that attracts more than 2,500 people will have to pay a special event fee of $268, if it will not require fire department personnel or equipment - and a whopping $368 if it does require fire department personnel or equipment. Now, how is that for paying for the services you use? I only learned of this proposed ordinance last night, so I am still pouring through it. With the hearing coming so soon and on top of a holiday weekend, to boot, it seems important that as many public eyes get a good look at this proposal as soon as possible. This is our City. Let's make sure that, for once, the Tzars of the sports world do not have sole dominion over our laws and do not wreck havoc upon our finances. Good news for those who believe that public tax money has been used to bloat and overpay administrator salaries in our public school districts. Kara Kenney, of WTHR, is reporting that Legislators will hold a summer study committee to look into the issue. "This summer, a bipartisan legislative committee will study pay and benefit packages for the state's 291 school superintendents" Kenney reported. State Sen. Jim Banks, R-Columbia City, requested the evaluation after 6News' coverage of former Wayne Township Superintendent Terry Thompson's $1 million retirement package. "I'm alarmed to watch your stories about superintendents making a $1 million severance package when they leave a school system," Banks said. "It's startling as a taxpayer." Banks said he believes administrator salaries have become bloated, all while teachers are being laid off and programs are cut. "The superintendent receives a nice package in one district, and the district next door demands to be paid as well as the other superintendents," Banks said. "I think it's caused inflation of salaries around the state, and that's why I think we need to look into the issue." Indianapolis Public Schools Superintendent Eugene White makes the most statewide, earning $272,940 for a district of more than 33,000 students. The superintendent of Greater Clark County Schools ranks second, making $225,500 in a district with just over 10,000 students. Donald Stinson of Decatur Township Schools ranked eighth, with a base salary of $189,287 for a district with about 6,400 students. The WRTV website provides a link to a list of superintendent salaries across the state.